Smart+ Light: Ready, Steady .... FOCUS ! Smart+ is a task light not only worthy of all the tags of the moment (IoT, smart light, sensor, human-centric, circadian rhythm, biodynamic light, LED, AI) but it is , above all, a wellness tool. It has been a great pleasure for me to collaborate, on behalf of Neocogita Srl, with a multidisciplinary and competent team that, in addition to the company coordinated by the MEZZALIRA group, includes the industrial design studio “Habits” di Milano and Graffiti 2000 S.r.l., a comunication firm of Riva del Garda. 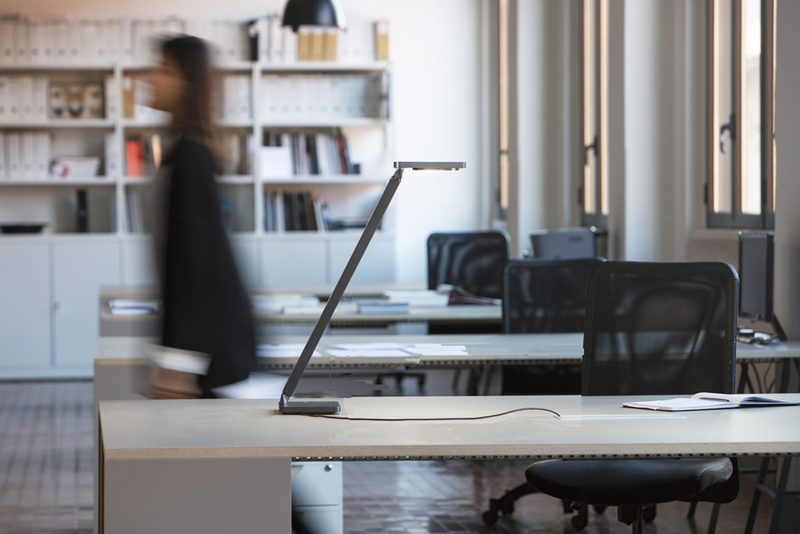 The name Smart+ is not just a reference to the technology of the lamp, but expresses its mission and concept. It is a light that supports focus, the cognitive activity involved in our mental work when we need to be productive, to take decision or simply to execute a task, whether we are at work or at home. In this technological age, which often demands us to be hyper-performing, working hard to the limit of our potential, it is fair we use technology to engage in healthy beahviour, in order to be aware of what this means. Our mental and physical well-being are essential for long-term productivity, and therefore, knowing the visceral relationship we have with nature and natural light, is essential to respect our limits and to know how to measure our efforts. Smart+ light is dynamic for intensity, distribution and color. By color we do not mean only its color temperature CCT (warm or cold) but its spectral distribution, able to range the right circadian efficacy over the course of the day, and therefore to respect our biological clock. I’s difficult to use words, to describe the complexity of this lamp, the naturalness of its light emission, the comfort experienced during its use. Smart+ uses a quality dual LED source that varies the intensity, the emission cone, the spectral diagram, and not only to capture the dynamic of natural light, but also to fit different user profiles, and drive, stimulate and modulate focus for each one of them. It is a delicate game of calibration, through data collection, interpretation and control, for a light output that takes into account individual needs and inclinations. A dedicated application for smartphones provides easy accessible data and a more personilized use thanks to well suited reports and profiles, which are ready to be shared and to be used for long term programs and goals. Words don’t come easy to explain the complexity of this lamp, nevertherless you will be amazed when you look at it for the first time, for the simplicity and essentiality of its aesthetic. Neocogita, a brainwellness company, had the role to investigate the latest results of research field studying the biological aspects of light, i.e. those factors responsable for the synchronization of the circadian rhythm and other system related. Qualitative and quantitative aspects of light regulate the release of melatonin, responsible for the wake-sleep cycle, but they include the release of other hormones too, such as cortisol and serotonin, which are involved in the regulation of alertness and good mood. Quality lighting not only ensures excellent visibility, provide accent and character to a space, but respects human biology and, with right light emission, support specific cognitive tasks, through a pathway which differs from the one involved in melatonin’s suppression. This recent investigation field, which studies the new neuronal pathways involved in other mental states (alertness above all), has not yet delivered striking outcomes. However, exploring the profound bond between man and light with innovative lighting proposals on the market, is welcomed even by the scientific world. Smart+ has got the merit of proposing a new light dynamic. The new lighting parameters have been submitted to an experiment and dats analysis, which has produced satisfactory results, in line with project expectations. Smart+ contributes to the mental and physical ergonomics for working environment, contrbutes to its regenerative property, and it does all that with discretion, enabling to coordinate preset patterns of use to individual physiology parameters. The presentation of the product in Milan will allow all interested people not just to evaluate closely the aesthetic and technological qualities, but also to experience a new interaction with artificial light, which is now characterized as a sort of "personal trainer", able to make user aware of the visceral relationship between man and light. A real celebration of man and of the user experience rather than just a spotlight over the design product itself, which makes Smart+ perfectly aligned with the theme of the italian event and with the current human-centric vision of design. L’ambiente costruito influenza le nostre percezioni, le nostre emozioni, le nostre capacità d’interazione, i nostri sogni e le nostre personalità. I risultati delle ricerche neuroscientifiche degli ultimi decenni hanno permesso di entrare nei meandri dei processi cognitivi e di conoscere i meccanismi neuronali che legano i nostri sensi ai vari stati emotivi, creativi, cognitivi, e operativi del nostro cervello. Si trattano le relazioni tra neuroscienze, neuropsicologia e design, dalla grande scala urbana, a quella architettonica e a quella del design. Si indaga sui mentalscape (paesaggi mentali) in contrapposizione ai paesaggi reali e sociali. Si analizzano le esperienze emozionali e cognitive che gli spazi costruiti offrono. Biofilia, UX, Neuroergonomia e Art-interaction sono ulteriori riferimenti . Lampada SMART+ : Ready, Steady ... Focus ! L'intelligenza naturale e la bellezza artificiale. Quale futuro per l'illuminazione ? Gli spazi lavorativi sono cambiati ...di nuovo.